I listened intently to the New York Times’s interview with Steve Bannon, the nationalist man of mystery who might be the most influential force in politics today. He is widely credited with bringing Trump to power with his populist message against the establishments of both parties. His answer keeps coming back to one central principle: economic nationalism. Listening to the interview, the appeal of his message is obvious. There is passion, even fire, in his voice. He is dedicated and focused. By his account, he represents the struggle of the common man against the elites. It’s a battle, a revolution, a war, and he won’t stop until the swamp is drained. What thrill! Who doesn’t like an old-fashioned people’s revolution against the establishment? Who can doubt that the ruling class is corrupt and needs to be upended in favor of a system more responsive to the people? I’ve been captivated by his ideological moorings for years but never quite had a handle on his core. It’s one thing to blast the status quo. But what replaces it? 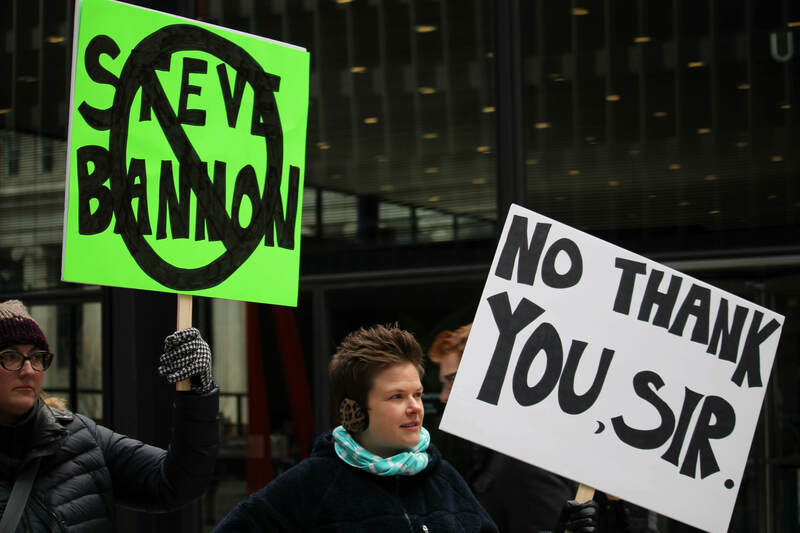 What precisely does Bannon want? Here is a guy who thinks of himself as a Catholic and an American but cites a Nazi theorist as a leading influence on his thought, while denying having any sympathies with white supremacy or anti-Semitism. He dismisses the alt-right as a bunch of powerless clowns. He thinks he has transcended all previous categories of political pigeonholing in favor of genuine democracy. It’s all very interesting, but once you get beyond the bravado and fireworks, the purges and power grabs, the sweeping talk of revolutionary upheaval, we have to ask the question raised by Vladimir Lenin: What is to be done? Lenin’s monograph made it clear that the one path forward for his own “people’s movement” was to seize the power of the state. This is something that the workers and peasants surely could not do, so therefore there needs to be a vanguard of elites to represent their interests. What does Bannon want to be done? The answer keeps coming back to one central principle: economic nationalism. In the interview, he comes back to it again and again. He believes that production should be national, not global. He blames shadowy “globalists” for making trade cross borders in ways that harm the American people. His agenda is to punish these foreign bad guys for ruining the American way of life. How do we punish these shadowy elites, in Bannon’s view? We build tariff walls. We impose quotas on imports. We stop imports in any sector where American jobs are threatened. We get the state to rally around national production even when it could be done for a fraction of the price in some other land. Trade has been an enormous blessing for the very people who are drawn to Trump/Bannon rhetoric. Here is a great irony: Bannon’s argument is not with some dangerous cabal of globalists who are imposing trade on us. His argument is with the buying habits of the American people. You would rather pay $10 than $100 for a scarf. You want an iPhone for $600 not $6,000. You want sheets, candles, suits, furniture, towels, and electronics at the lowest price possible. It is because of global trade that middle-income consumers enjoy, at the very least, a 29% higher living standard than they otherwise would. Trade resulted in a net gain of $1 trillion for the US economy in every year since World War II, which translates to $10,000 per household. Low- and middle-income consumers buy more products produced in a global marketplace than the rich, so any interruption would hurt them particularly hard. Just look at the prices for clothing that Americans pay, since 1994. We see a huge drop – and at a time when high inflation has hit education, health care, housing, and other national goods. What else can you think of that has fallen this much over the last 20 years? This is because of trade. Do you want to pay more for your kids’ clothes or less? That’s the real question. On a practical level, the only result of protectionism is that consumers in the United States pay more. This does not hurt the elites. It doesn’t hurt the establishment. If anything, it grants a subsidy to large businesses that the poor and middle class pay out of their paychecks that haven’t risen that much over the decades. Trade has been an enormous blessing for the very people who are drawn to Trump/Bannon rhetoric. Look at a sector that has been subjected to intense protection: sugar. Americans pay more than three times the world price for sugar. This is because of import restrictions. This is why your sodas use corn syrup instead of sugar. This is why the pie you buy at the store is made of corn instead of sugar. The consequences for the American diet have been horrible. Diabetes is 20% higher in countries that rely on corn syrup rather than sugar. In other words, this trade protectionism is not only breaking the bank; it is also killing us. Food manufacturers that use sugar are hostage to a byzantine combination of price supports and arbitrary import restrictions (such as those that torpedoed the Mexican supply). As a result, producing candy and many other food products is far more expensive here than abroad. Since 1997, sugar policy has zapped more than 120,000 jobs in food manufacturing, according to a study by Agralytica, an economic consulting firm. More than 10 jobs have been lost in manufacturing for every remaining sugar grower in the U.S.
Do we really want to expand this model to every sector of American economic life, as Bannon would have it? I don’t think so. The reason for global trade is that we want it. We prove it every day in our buying decisions. It is a saving grace in times of high taxes, stagnant economic growth, and flat incomes. The irony is intense: Bannon has somehow seized on the one feature of economic life that most benefits the working classes and targeted it for destruction in the name of helping the working class. His whole agenda can be reduced to one idea: tax working people more. What’s even more amazing is that this is not even a pro-American idea. The Declaration of Independence blasts the king for “cutting off our trade with all parts of the world.” That’s exactly what Bannon wants to do. You have met the conspiracy, and it is you. Bannon is not a stupid man. He can read the statistics, price charts, and trade flows just like everyone else. Why does he persist? My own supposition is that this isn’t really about economics; it’s about power. His power and that of his friends. Here we find the real beneficiaries of the policies he recommends. Bannon wants you to believe that some giant conspiracy is the reason for cheap products. If so, I invite you to visit the local WalMart or shop casually on Amazon. See what you do. See the origin of the products you consume. You have met the conspiracy, and it is you. Bannon’s plan is to take away the choices you make every day in the marketplace. This is not authentic populism. This is a cover for a power grab that will only end in enhancing the amount of power that government has over your life.